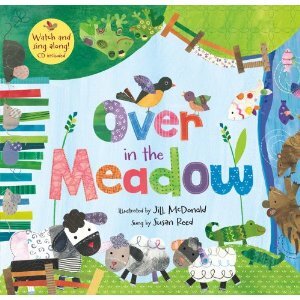 Over in the Meadow , illustrated by Jill McDonald and sung by Susan Reed is one of the newest in Barefoot Books' line-up of Sing Along books and CD's. We've talked about their sing along books once or twice because we LOVE them! When this new title showed up in the mail, both boys were thrilled. We eagerly look forward to finding a moment to sit down and listen to our favorite books and songs. I always anticipate joining my children in front of the CD player while we expose ourselves to the fantastical worlds that Barefoot Books throws us into. In this case, we're visiting a meadow. "I wink!" said the one. In the sand in the sun." Likely you've heard this rhythm and rhyme a time or two. To you it might be old school but for a young child, it is pure, new delight. Bookworm2 (age 2 3/4) bops his head along to the beat and we enjoy the robins, muskrats, mousies and spiders which Jill McDonald has brought to life in such a colorful fashion. This is a very cute book and certainly reaches the same levels of excellence as the other Sing Along books in Barefoot Books' collection. If you have a reluctant reader, or are just looking for a fun way to introduce a small child to story and song, consider these books. They are complete awesomeness. No, really. 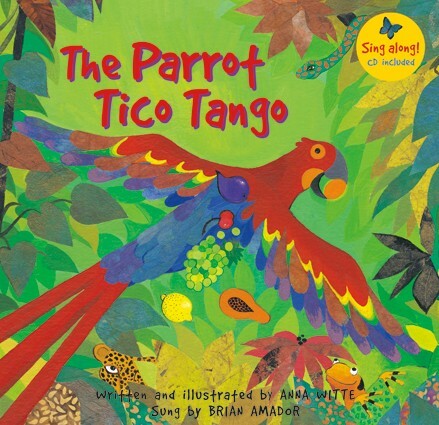 We also received a copy of The Parrot Tico Tango by Anna White to check out. (This book is available with a story CD which I discovered comes in very handy on long car rides!) We read the book for ourselves, which works just as well when you are home and spending time with one another and a good book. This story is about Tico Tango who was a very greedy bird. He kept finding delightful fruits in different colors that he just had to have. The problem was that the fruit he was finding belonged to other animals. Nevertheless, his greed consumed him and so he goes around grabbing and stealing it piece by piece until he finds that he has no more room in his beak to steal. In the end, he learns that it's better not to steal but to share, buy and/or trade for things you would like to have. It helps keep the peace - and it keeps you in good company with good friends. This story is also told in rhyme and is equally bright and cheerful as the first book mentioned above. We sure do appreciate the quality of story and artwork produced by Barefoot Books. Their books are nicely bound. The stories engaging. The music not at all painful to listen to (as is the case with some children's music.) They are a winning children's book publisher and I highly recommend them. Again. Thanks to Barefoot Books for providing the above two titles for me and my little guys to check out. I LOVE Over in the Meadow!! I remember that story/song from when I was a child but I had completely forgotten about it until your post. Yay for awesome songs! I know a little girl who could learn a thing or two from Tico Tango...ordered that as well as the tractor book for her yet unborn baby brother. Thanks for the suggestions...they'll love them!